War elephants had been used much earlier in India. By the time of the Mahabharata, there were four-arms based Armies (Chaturangbala) comprising infantry, horses, chariots and elephants. A tournament format of war as a force on force engagement in a vast open battle plain had crystallised. Vyuhas or battle formations coupled with battle drills were used to coordinate the action of four variable speed manoeuvre masses on the battlefield to maximise attrition and ensure physical destruction of the opposing force. This tournament format failed dismally against the far more manoeuvre-oriented paradigm of the Greeks of Alexander. The Greek Armies were based upon hard marching infantry phalanxes supported by light and heavy cavalry. Many battles took place on river banks where India’s prized chariots got bogged down. Kautilya, however, noted the terrific impact that just 200 war elephants of Porus had had on the Greek Army. Kautilya, therefore, did away with the war chariots. The chariot could carry only one or two archers and lacked cross-country mobility. It was, therefore, relegated primarily to ceremonial purposes. The war elephant, by contrast , could carry upto 8 archers and move anywhere, in the plains, forests, riverine or mountain terrain. Kautilya increased the number of war elephants in the Mauryan Army from 3,000 to 9,000; and used them in a mass to generate shock and awe. In just 25 years, with this war elephant led Army, he unified the whole of India. India, like China (of the period of the Warring States,) was then in a multi-polar situation. There were 16 Mahajanpadas or major states, – constantly at war with one another in South Asia. The Indian strategic culture had crystallised in this era of multipolarity. The same course of events had occurred in China in the era of Sun Tzu, when 6 major states in China were constantly at war with one another. Both these ancient civilisations, therefore crystallised their strategic cultures in similar periods of multipolarity. The world today is once again headed for a period of multi-polarity. Hence, the relevance of the lessons that come from that remote past to the present-day context. I have deliberately dwelt at length on this first local RMA in India in the preface itself, to explain the basis of this phenomenon that actually helped to decisively shape Indian history per se and crystallise its strategic culture. A series of RMAs (revolutions in military affairs) had profound implications in the socio-political sphere. Adopting this systems approach to the study of history enables us to isolate the key techno-economic triggers that brought about significant political phase transitions. Radical changes in the way war is waged have necessitated major economic changes. As the tools to wage war became more expensive, these could only be afforded by the larger states with a significant economic surplus. It was the Greek invasion of Alexander that served to crystallize India’s sense of self. Warfare in the subcontinent had till then followed a fairly ritualised format in which well developed and adhered to codes of military conduct confined battles to a tournament format where armies met on huge flat and open plains to fight force on force battles of attrition. Indian chariot warfare had brought in horses and an Indian aristocratic elite who used them: the chariot based knights (Maharathis) were the highborn Kshatriyas who formed the ruling class of that era. This mindset was based on pure attrition and chivalry. By the time of Alexander’s invasion, Northern India was divided into a host of tribal and clan-republics and petty principalities that were more often at war with themselves than with outsiders. The chariots totally lacked cross-country mobility and proved to be a great liability during the Greek invasion. The Greek paradigm of mobile warfare was based on highly disciplined infantry phalanxes and light and heavy cavalry acting in close concert. They were not encumbered by elaborate codes of ethics and rules that were relevant only in the subcontinent. Most battles took place on river banks where the Indian chariots got bogged down. This separated the command element from the troops and resulted in the defeat of the Indian Armies of that era. 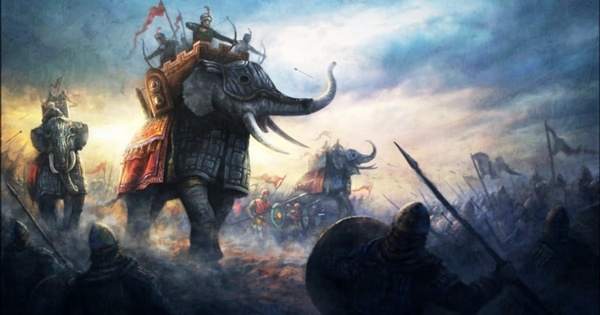 Nevertheless, the one weapon system that shook the Greeks was the Indian war elephant. The Elephant-Based RMA. The first real RMA in India, therefore, came with Kautilya’s raising of a massive shock corps of some 9,000 war elephants for the imperial Mauryan Army. Elephants were prohibitively expensive to obtain and maintain. As such, this radical change in the way of waging war necessitated the support of a strong centralised state with a huge economic support base. The larger the state, the bigger was the force asymmetry it could generate. After Alexander’s invasion, Kautilya ushered in the elephant-based RMA and thereafter took just 25 years to unite the whole of India into a highly centralized and tightly controlled empire. The multiplicity of micro-states in India gave way to an empire that unified the entire subcontinent. This RMA also ushered in significant sociological changes. Thus, unlike the chariots which carried a single high born warrior, the war elephants carried 6 to 8 soldiers. These were low born Shudras and, therefore, represented a major shift in the caste alignments. The Mauryas themselves were low caste. The traditional caste system was, thus, overturned and the merchant/trading castes accumulated great economic power. To generate economic resources for the huge corps of elephants, the Mauryas needed the support of the merchant guilds. The merchant classes, in turn, needed peace to carry out their trading activities. As such, they turned to the pacific faiths of Buddhism and Jainism. To enlist the support of its economically productive merchant classes, the state soon adopted Buddhism as its guiding ideology. Emperor Ashoka launched the greatest soft power or ideological offensive in world history by spreading the Buddhist doctrine to all corners of Asia. This Indian ideological empire of the mind has lasted till this date. The Mauryan state itself, however, declined and withered away and its military power rapidly faded within a century and half. The above article is an EXCERPT from the book The Rise of Indian Military Power: Evolution of An Indian Strategic Culture authored by Maj Gen GD Bakshi. 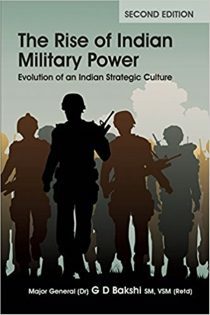 “The Rise of Indian Military Power: Evolution of an Indian Strategic Culture is possibly the first scientific analysis of Indian military history that has sought to study it in terms of a series of RMAs (revolutions in military affairs) that had profound implications in the socio-political sphere. Adopting this systems approach to the study of history enables us to isolate the key techno-economic triggers that brought about significant political phase transitions. Radical changes in the way war is waged have necessitated major economic changes. As the tools to wage war became more expensive, these could only be afforded by the larger states with a significant economic surplus. Questions have often been asked about whether India has a strategic culture at all? Is there an Indian way of war-fighting? This book seeks to answer these seminal questions,” writes Maj Gen GD Bakshi. Anasuya Anand calls herself a citizen of India rooted to HER rich glorious past.